Red Cross Pharmacy News & Info is designed to raise the community's knowledge and understanding of health-related issues and problems, and to improve its attitudes and skills towards issues regarding their health. Our intent is also to ensure the safe and effective use of medication in the community by improving communication between the pharmacist and the client. We hope that it will help you and your loved ones better understand how each of us can be more responsible for our own well-being. We'll cover issues that are of interest to those in our community and we welcome your feedback. 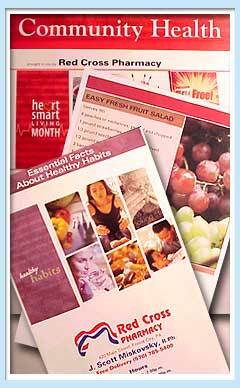 Each issue covers a variety of important health topics. IMPORTANT: The Red Cross Pharmacy provides these links as a resource for health information. The information provided is not intended to substitute for professional medical advice, for which your physician is your best source.